5NM spacecraft. Top, cross section. Below, exploded view showing each stage. Russian Mars lander. Cancelled 1974. 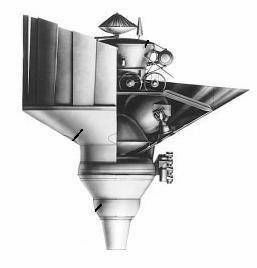 The 5NM was the first attempt by the Lavochkin bureau to design and fly a Soviet Martian soil return mission. Design and development was undertaken from 1970 to 1974. AKA: 4NM;5NM;Mars 1975. Status: Cancelled 1974. Gross mass: 20,000 kg (44,000 lb). Height: 10.00 m (32.00 ft). Diameter: 4.10 m (13.40 ft). Span: 11.00 m (36.00 ft). The immense 20 metric ton unmanned spacecraft would have been launched toward Mars in a single N1 launch. The spacecraft, protected by an unfolding aeroshell 11 m in diameter, would re-enter the atmosphere, land, scoop up some Martian soil, and boost a 13 kg return capsule on a trajectory back to earth. The entire mission would take 970 days, with launch slated for September 1975. The 4NM was a simpler variant that was originally to have been flown to Mars during the 1973 launch window. Instead of the return craft, it would land a modified version of the Lunokhod rover on the Martian surface. This would allow systems to be checked and achieve a scientific and propaganda first prior to the all-up attempt. With the cancellation of the N1 booster in 1974, the project came to a halt. It was resurrected soon thereafter as the even-more-marginal dual-launch 5M concept. At the beginning of 1970, the Babakin team had successfully completed development of the Ye-8 series of probes that returned lunar soil to the earth and placed an automated rover on the surface. They had thereby answered the American Apollo project and single-handedly redeemed the honor of the Soviet state after the string of failures in the secret Russian manned lunar flyby and landing projects. Babakin requested development of a preliminary technical proposal within the bureau to consider equivalent missions to Mars. The work was completed by the summer. The concept outlined was the launch of an enormous 5NM unmanned spacecraft to Mars on 17 September 1975. 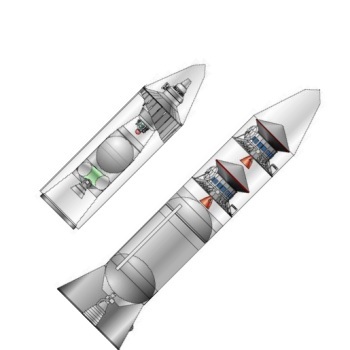 The N1 would place a 98 metric ton payload into low earth orbit, consisting of a 78 metric ton two-stage trans-Mars injection rocket and the 20 metric ton 5NM spacecraft. The trans-Mars injection stages would fire, placing the spacecraft on a trajectory toward Mars. The 5NM consisting of a 3600 kg Mars orbiter, and the 16 metric ton Mars lander. The orbiter would control the entire spacecraft and make midcourse corrections during the 377-day coast to Mars. The lander would separate from the orbiter at the end of the coast to Mars. The orbiter would brake into Mars orbit on 22 September 1976. The design used elements from earlier Babakin designs to reduce risk. These included the toroidal instrument module from the M-71 project, and the spherical fuel tank from the M-69 project. After the lander had touched down on the surface, it would serve as relay station to earth. The lifting asymmetric aeroshell, with a base area of 6.5 m to fit within the N1 shroud. 30 petals would be deployed in space to increase its diameter to 11 m.
At the base of the aeroshell was the instrument module that would handle the landing maneuver after the separation of the aeroshell. This contained a Doppler velocity meter, a radar altimeter, a radio system, program timing device, and a power system. The aeroshell would be jettisoned when the lander had been slowed to 200 m/sec. The soft landing system, composed of four spherical propellant tanks feeding four throttleable main engines. This would take the spacecraft from 200 m/sec to a zero-velocity soft landing on the surface. The lander stage included a panoramic camera that would be used to select a spot within reach of the robot arms of the spacecraft for a sample to be taken. The arm would swing up to the earth return capsule at the top of the stack, and deposit the soil in an inner sealed chamber. A two-staged booster rocket for return of the soil sample to earth. After three days on the surface, the first stage would place the second stage and Mars-Earth return module into a 500 km / 12 hour orbit of Mars. It would remain there for 200 days until Mars and Earth had moved back into position for the return journey. The second stage would fire on 27 July 1977, placing the spacecraft on a trajectory towards Earth. The Mars-Earth return module, with a mass of 750 kilograms. This was based on the Venus 4/6 orbiter design. It would provide navigation and midcourse-correction services during the 291 day earth-return coast. The spherical re-entry capsule, similar to that used for the Luna Ye-8 return missions, which had a mass of 15 kilograms and was to return 200 grams of Martian soil back to the earth. As with the earlier capsule, this was built to endure a high G ballistic re-entry into the earth's atmosphere. Re-entry over Soviet territory would occur on 14 May 1978. When the capsule had slowed to 200 m/s, a parachute would be deployed and a radio beacon would alert recovery forces as to the capsule's location. In order to test the spacecraft systems, it was planned to send a precursor 4NM spacecraft to Mars during the 1973 launch window. In place of the soil return payload, this would land a robot rover on the surface. The proposal was reviewed by a panel of experts, and several objections were raised. The most serious, in the view of Babakin, was the possibility of contaminating the earth with unknown Martian organisms if the re-entry capsule's parachute failed, and the capsule burst apart on impact with the earth. Interestingly the Russian engineers showed little concern for the contamination of the Mars by earth organisms on their lander. There were no plans for extensive decontamination, as the Americans were attempting on their spacecraft. More to the point, given the dismal record of Soviet Mars spacecraft to that date, was the very slight chance that all of the components of such a complex spacecraft would function correctly over the 970 days required to complete the flight. However Afanasyev supported the project as an answer to the American's planned 1975 Viking landings on Mars. It would be a chance to leapfrog the Americans and regain ascendancy in the space race. But Babakin refused to take the risk, and the project was shelved temporarily. After his shocking death at the age of 57 on 3 August 1971, the project was again revived. Work was mentioned as ongoing in Chertok's memoirs in 1972. However cancellation of the N1 in 1974 brought a complete and final end to the project for a single-launch Mars lander. The bureau had to turn to a two-launch scenario, which was pursued as spacecraft 5M. 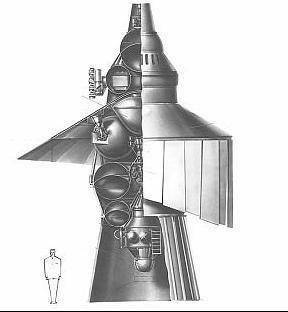 The 5M was a second attempt by the Lavochkin bureau to design and fly a Soviet Martian soil return mission. In 1974 the N1 booster program was cancelled and Mishin's failed TsKBM design bureau was reorganized into Glushko's new NPO Energia. Unlike the Mishin group, the Lavochkin team had a string of successful lunar and interplanetary probe missions. Afanasyev directed that they continue work on a Mars soil return mission to leapfrog the Americans. In the absence of the N1, the spacecraft would have to be put into low earth orbit using two launches of Chelomei's Proton booster. One launch would put a 22 metric ton fully-fuelled Block D upper stage equipped with the necessary rendezvous and docking system into low earth orbit. The second launch would place the combination of a partially-fuelled 13.5 metric ton Block D stage and the 8500 kg 5M spacecraft. The first Block D would rendezvous and dock with the second Block D. The stages would then fire, one after the other, to put the 5M on a trans-Mars trajectory. After the coast to Mars, the orbiter would separate and brake itself into Mars orbit, while the lander would re-enter the atmosphere at 5.6 km/s. Entry would begin at 100 km altitude at a 13 degree angle of entry. The aeroshell, shaped like the American Apollo capsule, would use lift during re-entry to reduce G forces and adjust the landing point. At 5.5 km above the surface, with the speed reduced to 1.0 km/s, the capsule would fly a pop-up maneuver, gliding to an altitude of 9.4 km and velocity of 700 m/s. At this point the landing radar would be activated and the terminal landing phase would begin. Low-thrust engines would begin operation at 3.03 km altitude and 355 m/s, followed by the high-thrust engines at 2.13 km and 338 m/s. The high-thrust engine package would be dropped when the lander reached 1.85 km/s altitude and 51 m/s. A constant-speed descent would then be made using the low-thrust system. Just 10 to 30 m above the surface the aeroshell would be jettisoned, the undercarriage lowered, and the lander would settle onto the surface. The landing site would be surveyed using panoramic cameras. The lander's robot arm would be commanded to scoop up some soil from a desirable location and insert it in a return capsule. The 2000 kg two-stage booster would then depart with the capsule, putting it in Mars orbit. 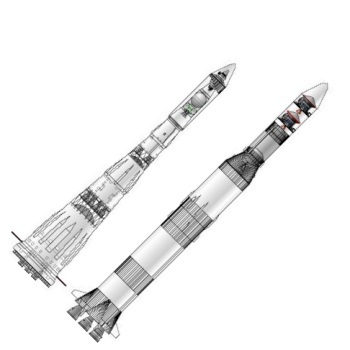 Meanwhile a third Proton rocket would have launched a separate Mars return craft toward Mars. This would brake into Martian orbit, then rendezvous and dock with the upper stage of the lander with the capsule of Martian soil. The capsule would be transferred to the return craft, which would then boost itself out of Mars orbit and head back to earth. It would maneuver yet again to place itself in a low earth orbit. A Soyuz manned spacecraft would rendezvous with the return craft, and retrieve the capsule with the Martian soil. This was considered necessary to allow study of the soil in space and ensure it was biologically safe before returning it to earth. Again the Soviet scientists showed a great concern to prevent contamination of the earth by suspected Mars micro-organisms. This elaborate scheme, calling for three automated rendezvous and docking maneuvers, was necessitated by the lack of a heavy lift booster in the Soviet Union. But it was considered by its chief designer, Perminov, too complicated to have much likelihood of success. Therefore another designer at Lavochkin, V P Panteleyev, was ordered by Afanasyev to pursue its further development. Panteleyev proposed modifying the Block D trans-Mars injection stages to allow cross-pumping of propellant from the first stage Block D to the second stage. This made for a more efficient burn sequence and allowed the spacecraft mass to be increased from 8,500 to 9,135 kilograms. The heavier Apollo-like re-entry vehicle was replaced by a low-drag pure ballistic aeroshell. This consisted of a 3 m diameter metallic base, and an umbrella-like construction of beryllium spokes with fiberglass cloth. This would deploy out to an 11 m diameter. These measures allowed for the mass of the two-stage Mars-orbit stage to be increased from 2,000 to 3,190 kg, allowing the soil to be returned directly to earth, and eliminating the need for a separate Mars return craft to be boosted by a third Proton launch. The final breakdown was: 1680 kg for the orbiter, and 7455 kg for the lander, including the 3,190 kg ascent stage. The revised design was approved by Lavochkin Chief Designer Kryukov in January 1976. However weight was still marginal, and a number of innovative solutions were found to further simplify the design. The sterilization of the soil samples would be conducted in Mars orbit using passive means, eliminating the contamination problem. The re-entry capsule was reduced to a mass of only 7.8 kg by eliminating all of the recovery aids - the parachute, altimeters, battery, homing beacon, and computer. The capsule would enter the earth's atmosphere at 12 km/s as a completely passive artificial meteorite. It was tough enough to sustain the impact with the earth without a parachute. Its landing position was expected to be known within 40 km, and a radioactive source would be included in the capsule. This would allow the recovery forces to locate it using radiation detectors. By 1978 the spacecraft was in fabrication. But suddenly political forces shifted. A government institute issued a report denouncing the whole enterprise as a high-risk, high-cost, low-chance-of-success venture. Afanasyev did an about-face and not only cancelled the project, but fired Kryukov as head of the bureau. Family: Mars lander. Country: Russia. Launch Vehicles: Mars tactical rocket, N1, N1 1969. Agency: Lavochkin bureau. Bibliography: 367, 589, 6681. The N1 and Saturn V launch vehicles of 5NM and Voyager contrasted. 1971 November 11 - . LV Family: N1. Work plan for L3M and the use of the N-1 booster for MKBS, stationary satellites, and Mars-75 - . Related Persons: Mishin, Afanasyev, Sergei, . Spacecraft: , MKBS, Mars 5NM, L3M. Organize a group for the study of systems specifications for MOK. a) For the transport system Earth - Orbit - Earth. b) For the interorbital tug - stationary orbit and others. c) For the control systems for MKBS and future systems. g) For the new reentry vehicle with L/D = 0.6.
d) For the coolant systems. e) For the SEP (need in stages). g) For the micrometeorite protection. h) For the radiation protection. i) For the pressurization systems, etc.